A total of 118 Israeli soldiers were killed in the fighting, and the army was often caught off guard by a well-trained guerrilla force backed by Iran and Syria that used sophisticated weapons and tactics. Soldiers, for instance, complained that Hezbollah fighters sometimes disguised themselves in Israeli uniforms. This week, Israeli Defense Minister Amir Peretz appointed a former army chief to investigate the military's handling of the war. Some of the harshest criticism has come from reservists, who form the backbone of the army. Israeli men do three years of mandatory service beginning at age 18, but continue to do reserve duty several weeks a year into their 40s. Israeli newspapers quoted disgruntled reservists as saying they had no provisions in Lebanon, were sent into battle with outdated or faulty equipment and insufficient supplies, and received little or no training. "I personally haven't thrown a grenade in 15 years, and I thought I'd get a chance to do so before going north," an unidentified reservist in an elite infantry brigade was quoted as telling the Maariv daily. Israel's largest paper, Yediot Ahronot, quoted one soldier as saying thirsty troops threw chlorine tablets into filthy water in sheep and cow troughs. Another said his unit took canteens from dead guerrillas. "When you're thirsty and have to keep fighting, you don't think a lot, and there is no time to feel disgusted," the unidentified soldier was quoted as saying. The newspaper said helicopters were hindered from delivering food supplies or carrying out rescue operations because commanders feared the aircraft would be shot down. In some cases, soldiers bled to death because they were not rescued in time, Yediot Ahronot said. The Israeli military said it was aware of the complaints, had tried to address them in the course of the fighting and was still looking into them. It had no comment on specific complaints. Comrades of the two soldiers captured by Hezbollah sent a petition to the prime minister Thursday accusing the government of abandoning the men. "We went to reserve duty with the certainty that all of Israel's citizens, and the Israeli government, believe in the same value that every combatant learns from his first day in basic training — you don't leave friends behind," the soldiers wrote. "This is a moral low point. 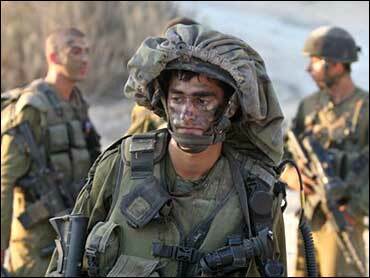 The Israeli government has abandoned two IDF (Israeli Defense Force) combatants that it sent on a mission." The petition was being circulated Friday; it was unclear how many soldiers had signed it. While such sentiments aren't shared by all soldiers, even some senior commanders acknowledge the army came up short in Lebanon.